*Whoa! This is a BIG deal. This could be a game changer! 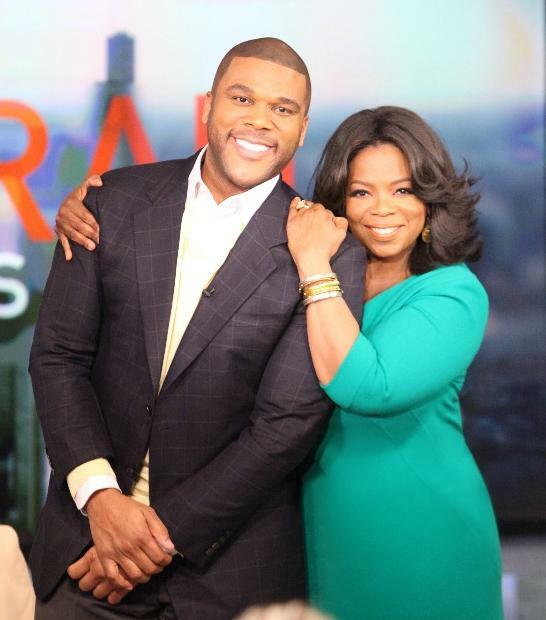 Today, OWN – Oprah Winfrey Network announced an exclusive partnership with Tyler Perry, the award winning actor, director, screenwriter, playwright and producer, to become his singular destination for all new television series and projects, including two new scripted series for the network to premiere in mid 2013. These will be the first original scripted series for OWN and Perry will executive produce, write and direct both series. The announcement comes as OWN’s momentum and ability to draw new viewers continues to grow. The network closed its third consecutive quarter of year-over-year, double-digit ratings gains across primetime and total day in the key women 25-54 demo (+63% and +70% respectively) and saw triple-digit ratings growth in September. OWN’s flagship series “Oprah’s Next Chapter,” featuring Winfrey’s interviews with top news-making celebrities, has given the network its highest ratings ever, hitting #1 in its time period in all of cable multiple times. The fall premiere of the OWN original primetime series “Iyanla: Fix My Life” featuring life coach Iyanla Vanzant garnered the network’s highest rated series debut in network history and the return of the popular family docu-series “Welcome to Sweetie Pie’s” hit an all-time series high. In addition, the thought-provoking documentary series “Our America with Lisa Ling” recently wrapped its summer season posting triple-digit gains versus year ago numbers. Great news from two of my favorite people! I am happy to hear that OWN is goingto branch out and diversify the network. I tune in to OWN more often now to catch Oprah’s next chapter and Welcome to Sweetie Pies two of my favorites. Welcome to Sweetie Pie’s is my SHOW! I love myself some Miss Robbie! Oprah and Tyler are such good friends so it was only fitting that they work together some how. Good for them! A match made in heaven. This will make OWN the network to watch. Congratulations. I like it and I watch for better or for worse and I really like it. This is a great power move! all righty now! Well you’ve given me yet another reason NOT to watch your network. Why not hire the producers of Soul Plane? It’s no worse than Tyler’s sitcoms. I agree with you. I don’t think Oprah will have any of Tyler Perry’s “minstrel” shows on. They will probably be more of the “My man did me wrong” type of shows. ..lolololol…You made me spit on my screen. I was thinking the same thing. I hope there will be better scripted programs with Tyler’s work because its a drab but I’m glad that Oprah is finally giving her own people an opportunity to showcase their talents. This is great news as two great moguls are working together to establish something and give the universe a glimpse into the diverseness of Black Americans! It’s about time – but, hey at least it’s happening NOW on OWN!!!! Jean and Musb, I was thinking the same thing as you when I read this. Her “strategy” is more and more transparent. She made a career out of being race “neutral,” but when times got hard, she decided to turn to “those Blacks because they like to watch TV.” lol Reminds of the politician who only shows up the weekend before the election to reach out to voters “because those Blacks like to go to church, I’ll catch them there and scare them into voting for me.” I like Oprah, but I don’t like this kind-of sinister pandering. That said, if she MUST pander, why do it with bootleg Tyler Perry? Why not use someone who actually knows how to write intelligently for Black audiences? Those type of writers do exist and Tyler Perry is just not one of them. He might be a nice guy, but he’s also overrated and almost insultingly low-brow. But whatever, the deal is done. I’ll just stick to catching Oprah’s Next Chapter whenever I catch it or the Life Class tour she does from time to time. That’s about it. While it’s easy to dismiss what you imply here, it becomes clearer when you consider who she chose as a vehicle. Tyler Perry, the man who has not provided any intellectual weight to any subject pertaining to black folk. So why not make his debut a continuation of his horrible stage plays and TV sitcoms? Black folk = no intellectual rigor = Chitlin’ Circuit = Tyler Perry. One caveat, if Tyler comes with something along the lines of “The Family that Preys,” there might be hope for him. It was not an Oscar film, but it was the most he’s stretched artistically and the most successful he has come to “good” writing. Don’t forget Why Did I Get Married 1 and 2. They were both well made movies and I’m not a fan of Meet the Browns or really any movie of his with Madea in it. So if he writes shows such as the one you mentioned as well as the ones I’ve stated…it should be fine. And hopefully it’ll put a lot of black actors and actresses to work. We need to see more of that in Hollywood instead of us being on reality shows being ratched!